Uefa has called on Fifa to bring in "concrete" changes to the way it is governed within the next three months. Uefa general secretary Gianni Infantino said: "The Uefa executive committee hopes to see results in three months." Corruption allegations have dogged Fifa with executive committee members Mohamed Bin Hammam and Jack Warner suspended over bribery accusations. 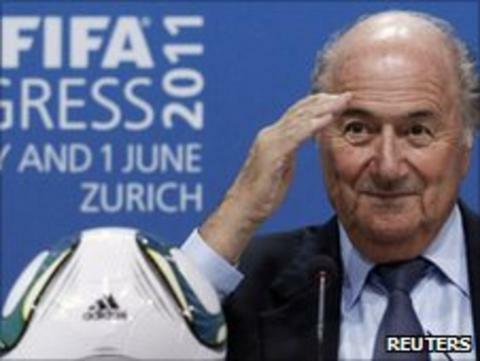 President Sepp Blatter was then re-elected after a committee decreed he had "no case to answer". Infantino was speaking at the conclusion of the June meeting of Uefa's executive committee. He added: "The executive committee has taken note of the will of Fifa to take concrete and effective measures for good governance. "It hopes to see results within three months and it is following the situation closely. "We want whatever it is Fifa chooses to do to be concrete." Uefa has also announced a new suspension for players deliberately incurring yellow cards in European competition. Last season Real Madrid coach Jose Mourinho was handed a touchline ban and Xabi Alonso and Sergio Ramos were fined over incidents in the Champions League group game against Ajax last November when the two players earned second bookings for conspicuous time-wasting. Barcelona's Andres Iniesta also faced allegations of a similar offence during his side's quarter-final win over Shakhtar Donetsk but escaped punishment. Players found guilty of the offence in future will now be banned for two matches. Infantino said: "Up to now, this kind of conduct has been penalised with a fine, but now there will be an additional match of suspension on top of the one automatically given after an accumulation of yellow cards. "We are also strengthening our rules with regard to the whole cancer of match-fixing, manipulation and corruption by foreseeing measures giving the possibility to the disciplinary bodies and inspectors to co-operate much more closely with the public authorities. "We are co-operating already, but we did not have the legal base - we will now have it much more clearly." The meeting also set out the prize money for next year's European Championship in Poland and Ukraine, with £6.53m (7.5m euros) on offer to the winning team.